Kitchen and family room remodel, master bath remodel and addition, bathroom remodel, living/dining/entry remodel, window replacement. The Feng family wanted to undertake a phased whole house renovation to their 3700 square foot Los Altos Hills residence built in 1960. The master bath was to be enlarged in phase one, and the rest of the house to be updated four years later, in phase two. The new master bath addition needed to integrate seamlessly with the original construction, filling the outdoor space between the garage and house. Natural light would be needed in what would be a long, narrow space buried between the two existing structures. In phase two, the family wanted to renovate the interior architecture and design character of the remainder of the house. Beginning with phase one, the expansion and remodel of the existing master bathroom, a new roof ridge was added perpendicular to the existing ridges of the house and the garage. The roof ridge that was needed to integrate the two structures did not result in a location that related well to the interior layout. We placed a series of false rafters on one side of the bathroom to shift the ridge so that it would be centered over the sinks. 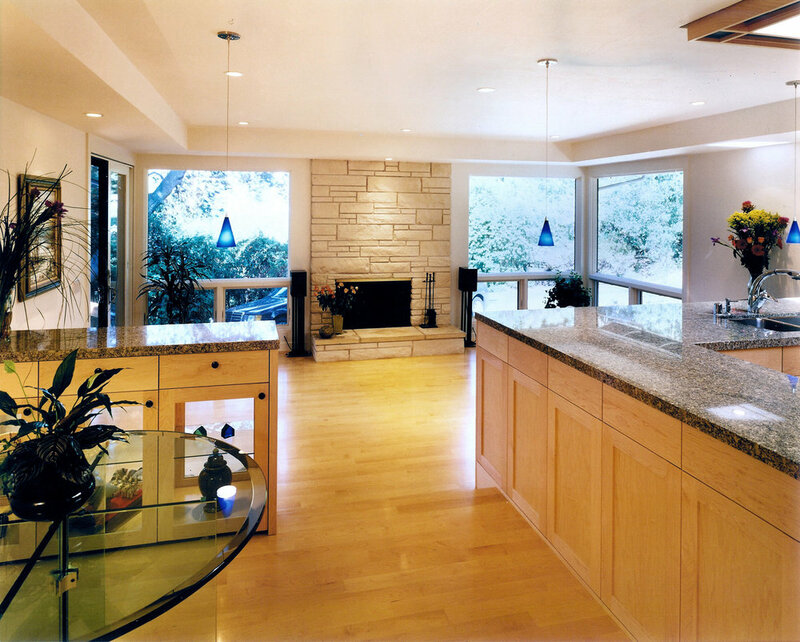 The whole house remodel in phase two included two other bathrooms and the kitchen, family, living, and entry areas. The new kitchen cabinets separating the kitchen from the family room were made deeper to accommodate the audio/video system in the family room, and a lighted cabinet provides two-sided display and storage in the breakfast area. The railings in the living and family rooms and entry were removed and redesigned, soffits were added, and the fireplace was refaced. Maple flooring was used throughout the main public spaces. All of the interior and exterior doors, windows, and trim were replaced. The tall ceilings in the new master bath created a light filled space. The bathroom is much more spacious. The roofline centers on the sinks, bringing visual order to the space. 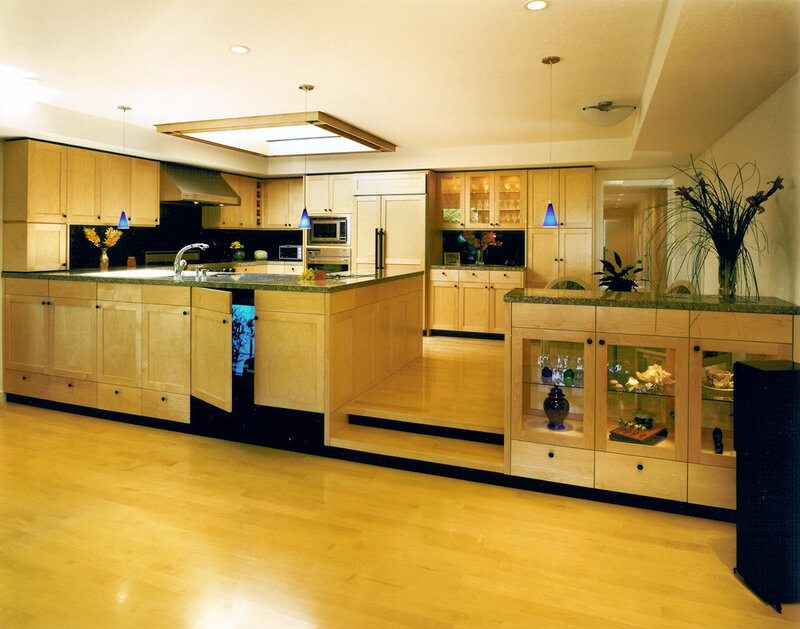 Throughout the house, the consistent use of maple flooring creates a strong flow through all the interior spaces. The soffits also visually tie all the spaces together. Multi-functional cabinetry serves as both divider and storage, carrying the clean and contemporary look throughout the entire kitchen, breakfast, and family areas. More natural light was created internally by lightening the finishes throughout. The newly designed interior spaces are characterized by clean, contemporary lines that come together to create a warm inviting environment.